Since I've changed role and started performing architect duties, I have to draw more boxes and arrows than write code. There are ways to fight that, like contributing to open source projects during sleepless nights, POCs, demos, but drawing boxes to express architectures and designs is still big part of it. 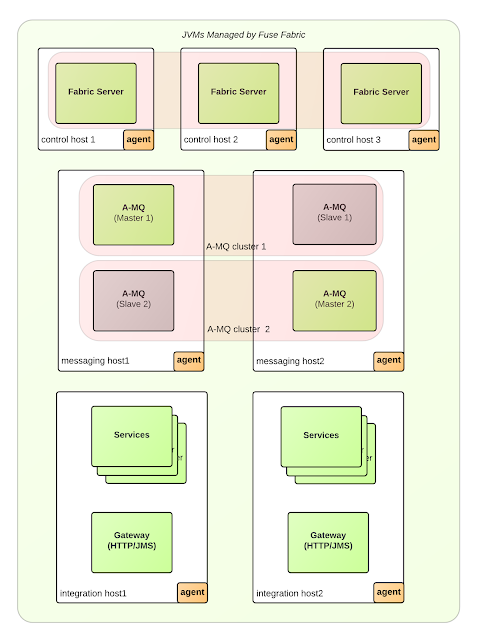 This post is about visualising distributed messaging/SOA/microservices applications in agile (this term has lost its meaning, but cannot find a better one in this case) environments. What I like about the software industry in recent years is that the majority of organisations I've worked with, value the principles behind lean and agile software development methodologies. As long as it is practical, everyone strives to deliver working software (rather than documentation), deliver fast (rather than plan for a long time), eliminate waste, respond to change, etc. And there are management practises such as Scrum and Kanban, and Technical Practises from Extreme programming (XP) methodology such as unit testing, pair programing, and other practises such as CI, CD, DevOps to help implement the aforementioned principles. In this line of thinking, I decided to put together a summary of the design tools and diagrams I find useful in my day to day job while working with distributed Systems. Every project kicks off with big ambitions, but there is never enough time to do things perfectly, and at the end we have to deliver whatever works. And that is a good thing, it is the way the environment helps us avoid gold plating, YAGNI, KISS, etc. so we do just enough and adapt to chance. 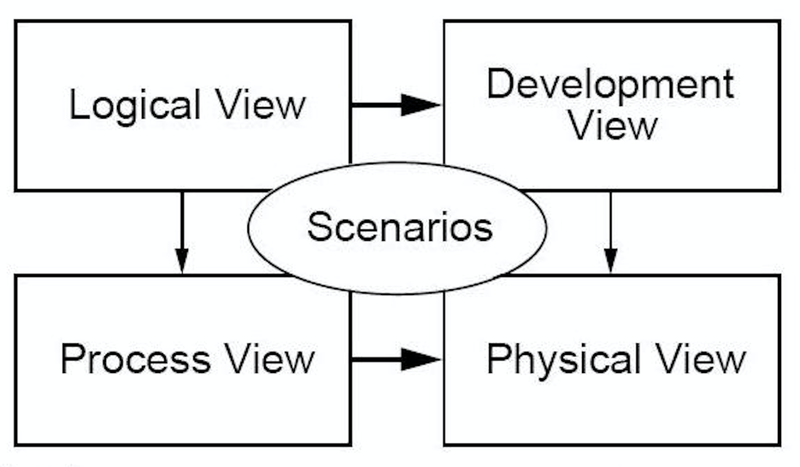 Looking back, I can say that most of the diagrams I've seen around are inspired by 4+1 view model of Philippe Kruchten which has Logical, Development, Process and Physical views. Typically these views are expressed through UML, and for each view, you have to use one or more UML diagrams. The fact that I have to use 15 types of UML diagrams to communicate and express a system architecture in an accessible way, defeats its purpose. With such a complexity, the chances are that there are only one or two people in the whole organisation who has the tools to create, ability to understand and maintain these diagrams. And having hard to interpret, out of date diagrams is as useful as having out of date gibberish documentation. These diagrams are too complex and with limited value, and very quickly they turns into liability that you have to maintain rather than asset expressing the state of a constantly changing system. 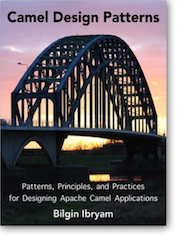 Another big drawback is that the existing UML diagram types are primarily focused on describing object-oriented architectures rather than Pipes and Filters architectures. 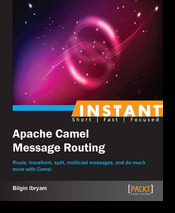 The essence of messaging applications is around interaction styles, routing, data flow rather than structure. Class, object, component, package, and other diagrams are of less value for describing a Pipes and Filters based processing flows. Behavioural UML diagrams such as activity and sequence get closer, but still cannot express easily concepts such filtering and content based routing which are fundamental part of integration applications. Having different set of views for a system, to address different concerns is a great way of expressing intend. But the existing views of 4+1 model doesn't reflect the way we develop and deploy software nowadays. 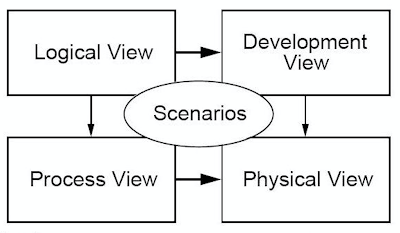 The idea that you have a logical view first, which then leads to development and process view, and those lead to physical view is not always the case. The systems development life cycle, is not following the (waterfall) sequence of requirement gathering, designing, implementing and maintaining. Instead other development methodologies such as agile, prototyping, synchronise and stabilise, spike and stabilise are used too. In addition to the process, the stakeholders are changing too. With practises such as DevOps, developers have to know about the final physical deployment model, operations have to know about the application processing flows too. Modern architectures such as microservices affect the views too. Knowing one microservice is in a plethora of a services is not very useful. Knowing too much about all the services is not practical either. Having the right abstraction level to have a system wide view with just enough details becomes vital. There are some good tips for drawing in general. The closest thing that has been working for me is described by Simon Brown as C4 model. (You should also get a free copy of Simon's awesome The Art of Visualising Software Architecture book). In his model, Simon is talking about the importance of a common set of abstractions rather than common notation (such as UML) and then using simple set of diagrams for different level of abstractions: system context diagram, container diagram, component diagram and class diagram. I quite like this "Outside-In" approach, where you first have 10000 foot view and with each next level, going deeper with more detailed views. C4 is also not an exact match for middleware/integration applications either, but it is getting closer. If we were to use C4 model, then system context diagram would be one box that says ESB (or middleware, MOM, microservices) with tens of arrows from north to south. Not very useful. Container diagram is quite close, but the term container is so overloaded (VM, application container, docker container) which makes it less useful for communication. 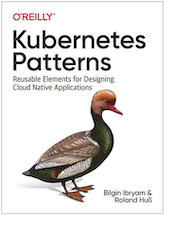 Component and class diagrams are also not a good fit as Pipes and Filter architectures are focused around Enterprise Integration Patterns, rather than classes and packages. So at the end, what is it that worked for me? It is the following 3 types of diagrams which abbreviate as SSD (not as cool as C4): System Context Diagram, Service Design Diagram and Deployment Diagram. The aim of this model is to show all the services (whether they are SOA, Microservices) with their inputs and outputs. Ideally having the external systems on the north, the services in the middle section, and internal services in the south. Or you could use both external and internal services on both side of the middleware layer as shown below. Also having the protocol (such as HTTP, JMS, file) on the arrows, with the data format (XML, JSON, CSV) gives useful context too, but it is not mandatory. If there are too many services, you can leave the protocol and the data format for the service level diagrams. I use the direction of the arrow to indicate which service is initiating the call rather than the data flow direction. 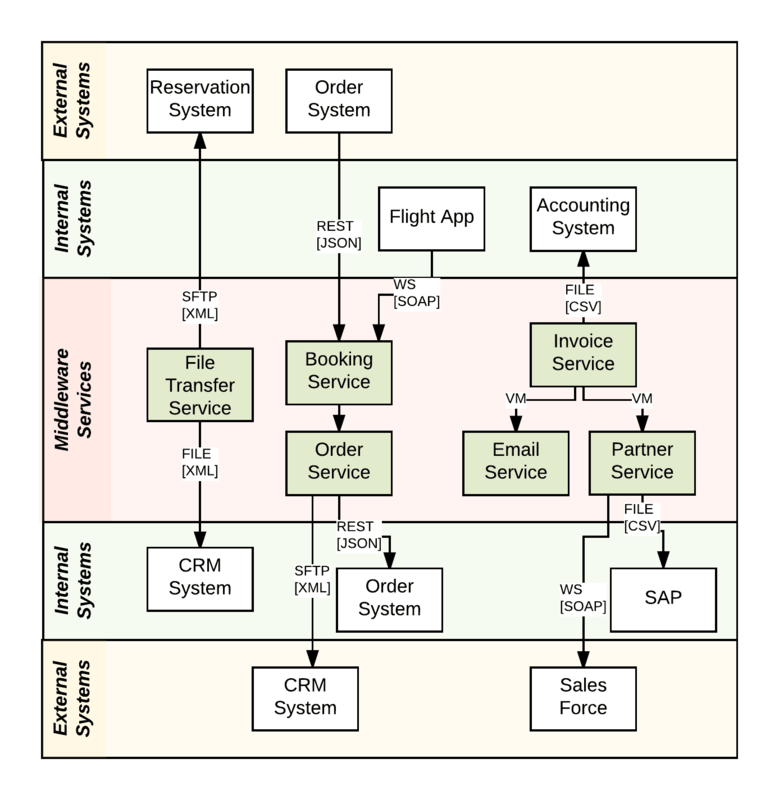 The aim of this diagram is to show what is going on in each box representing a middleware service from the System Context Diagram. And the best diagram for this is to use EIP icons and connect those as message flows. A service may have a number of flows, support a number of protocols, implement real time and/or batch behaviour. 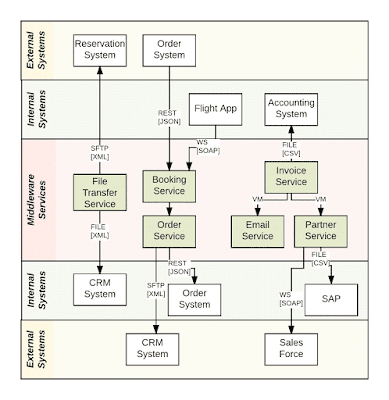 The previous two diagrams are the logical views of the system as a whole and each service separately. 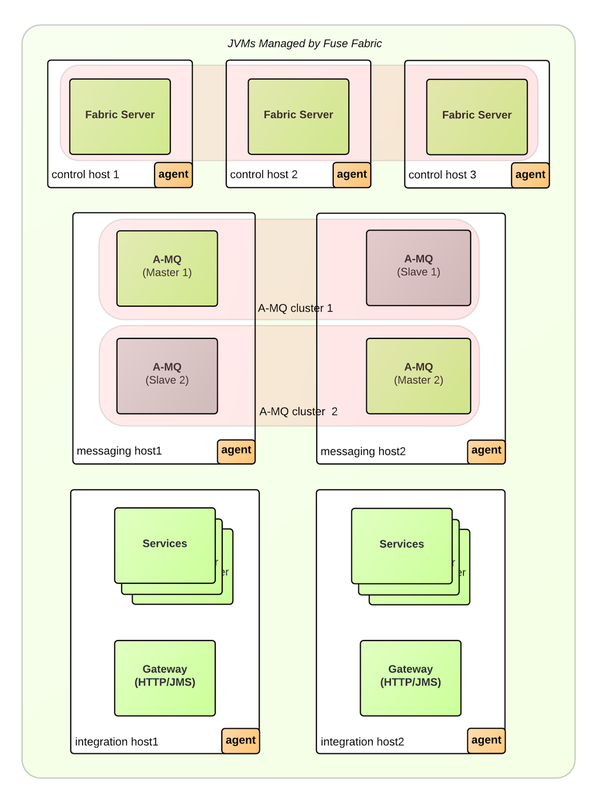 With the deployment diagram, we want to show where each service is going to be deployed. May be there will be multiple instances of the same service running on multiple hosts. May be some services will be active on one host, and passive on the other. May be there will be a load balancer fronting the services, etc. Mac OS: OmniGraffle with icons from graffletopia.This is what I've used to create all the diagrams for Camel Design Patterns book. Web: LucidCharts which ships EIP icons by default. That is the easiest to use tool and accessible from everywhere. It is my favourite tool (with MS Visio import/export options for Windows users), and has free account plans to start with. Web: DrawIO another web tool with EIP icons. The beauty of this tool is that it forces you to use your own storage options for the diagrams, such as: google drive, dropbox, locally, etc. So you own the diagrams and keep them safe. Hawtio - the Camel plugin can visualize running Camel routes as EIP diagrams. 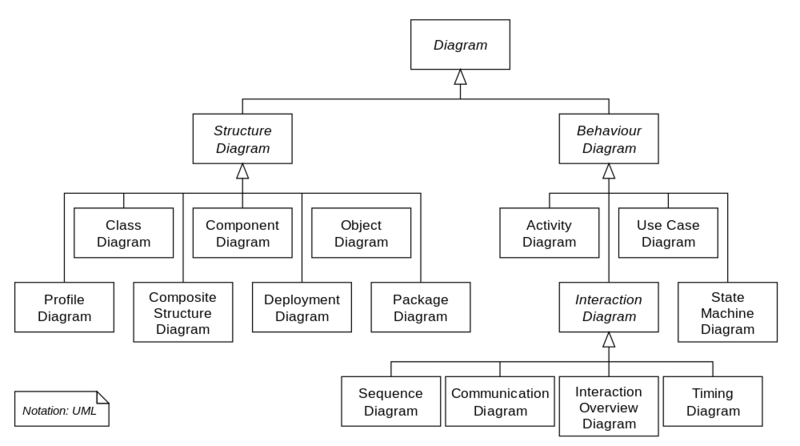 System Context Diagram is useful to show the system wide scope and reach of the services, Service Design Diagram is good for describing what a service does, and Deployment Diagram is useful mapping all that into something physical. In IT, we can expand work and fill up all the available time with things to do. I'm sure given more time, we can invent 10 more useful views. But w/o the above three, I cannot imagine myself describing an integration application. As Antoine de Saint-Exupery put it long ago: "Perfection is finally attained not when there is no longer anything to add but when there is no longer anything to take away."